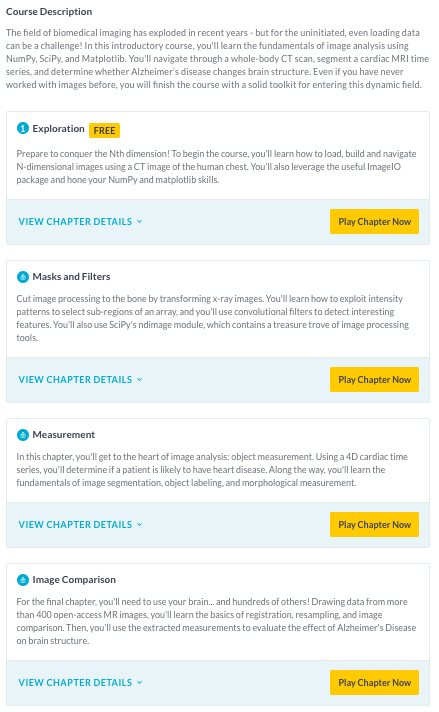 Learn the purpose of chapter descriptions and where to find them on DataCamp. In addition to your course description, each of your chapters must have its own description. Chapter descriptions are available on your course landing page, just below the course description. This is your opportunity to market your course, so make sure to take advantage of it! Generally, these should be a bit more focused than your course description as they should only cover what's in that chapter. Mention concepts, functions, and datasets, but make it fun, not clinical! You just need two to three sentences for a great chapter description. Important: Chapter descriptions are written in YAML, not Markdown; therefore you should not include contractions (apostrophes are reserved characters), colons (also reserved), or backticks, as they will not render text as inline code. From Biomedical Image Analysis in Python, the chapter descriptions are fun, incorporate the datasets, and make it clear what you'll do in the exercises. Exploration: Prepare to conquer the Nth dimension! To begin the course, you'll learn how to load, build and navigate N-dimensional images using a CT image of the human chest. You'll also leverage the useful ImageIO package and hone your NumPy and Matplotlib skills. Masks and Filters: Cut image processing to the bone by transforming x-ray images. You'll learn how to exploit intensity patterns to select sub-regions of an array, and you'll use convolutional filters to detect interesting features. You'll also use SciPy's ndimage module, which contains a treasure trove of image processing tools. Measurement: In this chapter, you'll get to the heart of image analysis: object measurement. Using a 4D cardiac time series, you'll determine if a patient is likely to have heart disease. Along the way, you'll learn the fundamentals of image segmentation, object labeling, and morphological measurement. Image Comparison: For the final chapter, you'll need to use your brain... and hundreds of others! Drawing data from more than 400 open-access MR images, you'll learn the basics of registration, resampling, and image comparison. Then, you'll use the extracted measurements to evaluate the effect of Alzheimer's Disease on brain structure.